Joye eVic Basic comes with 60W output & 1500mAh battery capacity, which features compact size, RTC & custom logo function, optimal top airflow and refilling system. Cubis Pro mini matches eVic Basic perfectly. Joye eVic Basic kit has the upgradeable firmware with maximum output updating to 60W. It especially comes with the new colorful wrinkle paintings which has a remarkably deep rich texture. The E-juice filling can be easily achieved by simply removing the top cap and injecting into the side holes. The innovative CUBIS Pro Mini with leak resistant cup design allows you to enjoy the best vaping experience ever. 10 colors for your selection. • Compatible with BF Replacement Coil, BF RBA Head, NotchCoil DL Head, QCS Head and LVC Clapton MTL Head. because of small battery, so charging frequently. atomizer is louder than some brand. overall is good. Top Produkt Joyetech. schnell aufgeladen,viele verschiedene Einstellungen. für jeden Geschmack. Sonst alles Top. tolles Produkt. absolute Kaufempfehlung! 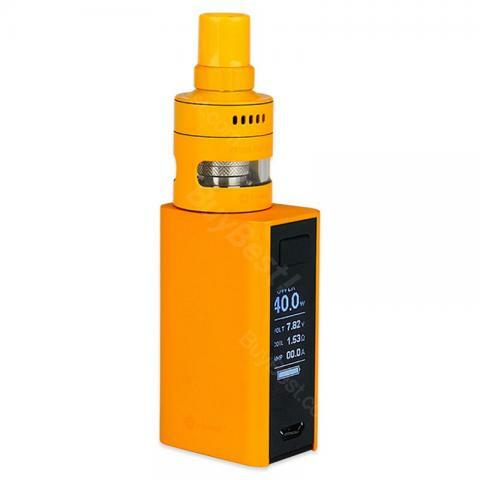 Joyetech eVic Basic fits CUBIS PRO Mini Tank perfectly and looks awesome. Very happy with it and fast delivery!